The biggest value delivered by the Entity form control was its ability to quickly display default (standard) forms for a given Common Data Service entity to help speed up the app authoring process. This ability is now also built-in to the most commonly used PowerApps controls (as listed earlier). 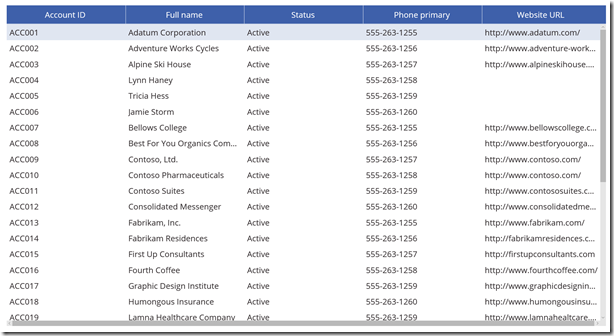 When an app author connects these PowerApps controls to a data source for a Common Data Service entity the framework provides a great default (standard) form. For details, please refer to this blog post on intelligent initial selection of fields. 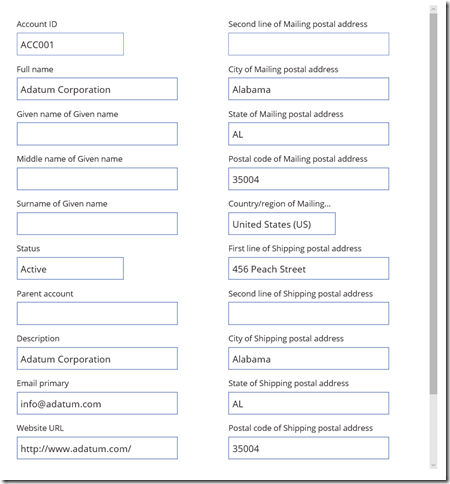 With the functionality of the Entity form incorporated into the most popular PowerApps controls, the Entity form control that was released as an experimental feature, has served its purpose and is being deprecated. Starting with PowerApps version 2.0.720 app authors can no longer add new Entity form controls in their apps. Existing Entity form controls in apps will continue to work until version 2.0.770 and starting with PowerApps version 2.0.780, Entity form will be no longer supported. We recommend that app authors migrate all existing usage of the Entity form control to other PowerApps controls within this timeframe. 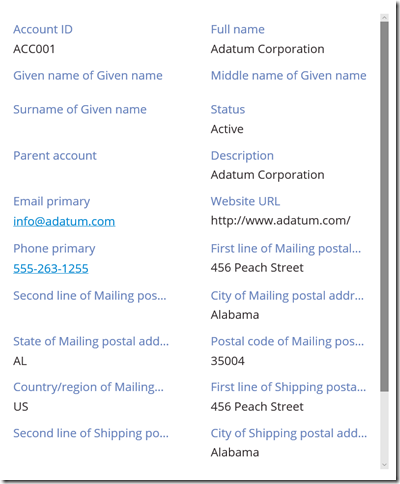 Below you can find detailed migration guidance to move your Entity form control usage to other PowerApps controls. To get a tabular list of records like the Entity form control (Pattern = FormPattern.List), use the Data table control. To get a card list of records like the Entity form control (Pattern = FormPattern.CardList), use the Gallery control. To get a read-only details view of a record like the Entity form control (Pattern = FormPattern.Details, Mode = FormMode.View), use the Display form control. To get an editable details view of a record like the Entity form control (Pattern = FormPattern.Details, Mode = FormMode.Edit), use the Edit form control. 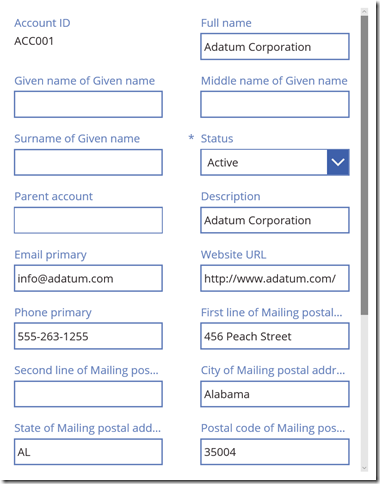 The default forms displayed by the PowerApps controls are like the ones displayed using the Entity form control because they are using the same metadata i.e. the field groups on the Common Data Service entities. 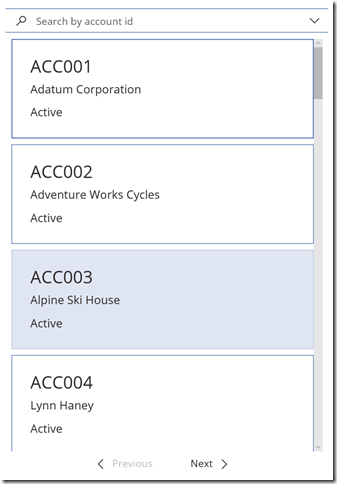 With the Entity form control, app authors cannot make any changes to the form directly in PowerApps Studio, instead they must update the corresponding field group(s). 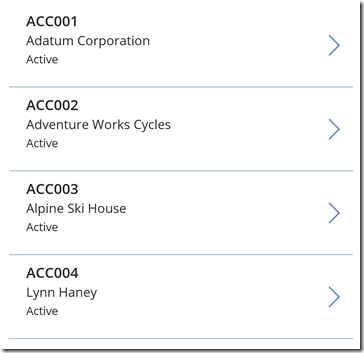 With the PowerApps controls we have made customization easier. When using the PowerApps controls, once app authors have a default form, they can customize it directly in Studio to add/remove fields as they see fit. Further these changes apply only to that specific form in their app, so they do not have to worry about their changes affecting the default field groups or other forms and apps. 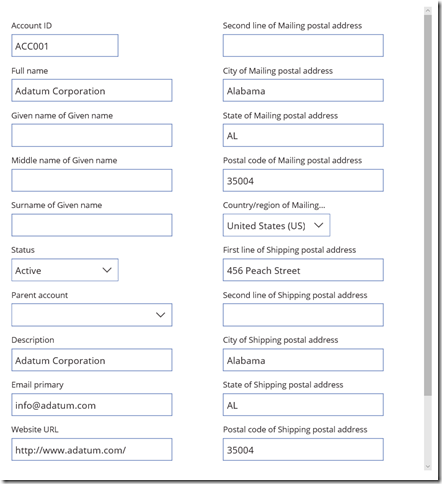 The Entity form control can only be used with Common Data Service but the intelligent initial selection of fields feature, which enables the display of default forms for PowerApps controls, is not limited to a specific data source type. Common Data Services is one of the first data sources to light up the feature. In the future we will see more data sources taking advantage of this feature to provide great out of the box default forms for a variety of data sources. For more information, please refer to this blog post on intelligent initial selection of fields. To achieve contextual navigation the Entity form control relied on some special properties such as SelectableFields, SelectedField and OnFieldSelect. With PowerApps controls app authors can use the Navigate function in a formula on the existing OnSelect property of the controls. To migrate tabular list navigation scenarios, use the Data table control and set the OnSelect and IsHyperlink properties of the corresponding column control. For details, please refer to this blog post on making column-level adjustments in the Data table control. Note: The properties are set on the column control of the Data table. To migrate details navigation scenarios, use the Display form, Edit form controls and set the OnSelect property of the control displaying the value of the field within the data card. Note: The properties are set on the control displaying the value of the field in the data card. The Entity form control also provides a built-in search control. While that has many advantages, it does not allow customization. 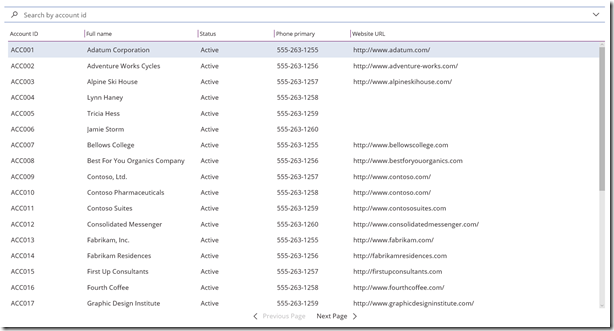 With PowerApps controls app authors can use a Filter or Search function in a custom formula on the Items property of the Gallery and Data table controls to enable and customize filtering and searching capabilities based on their requirements. Lastly, the Entity form control also provides rich detailed lookups. The Edit form control already supports basic lookups via the combo-box control. We are also working to enhance the combo-box control to support richer lookup capabilities and in a future release. Thank you once again for actively using PowerApps and the Entity form control and providing valuable feedback. We hope that our work to carry forward the capabilities of the Entity form control to other more commonly used PowerApps controls helps app authors continue to build great PowerApps faster.